I’m happy to let you know that Seams, Closures + Hems, the second of the two DVDs I filmed with Interweave this summer, is now available for purchase. This new video is intended as a companion to the first, Apparel Sewing Basics. As the title implies, this video focus on the techniques that you can use to give your garments a professional finish. In it I walk you through four different types of seam finishes, button holes and zippers, and three different styles of hemming (including some hand hemming techniques that will give your sewing projects a beautiful finish). I also share some information about my design process and give you some other tips for improving your sewing and making it more enjoyable. Here’s a short preview of what you’ll see in the 107-minute video. 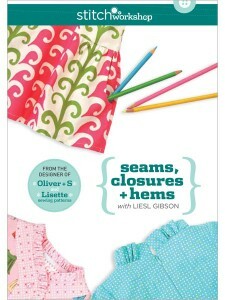 Seams, Closures + Hems is now available as a download on the Interweave website. They are also taking pre-orders for those who prefer to wait to receive a DVD version. We will have DVDs for sale on our website later this fall. I hope you enjoy watching this video as much as I enjoyed making it!